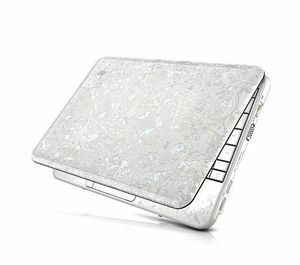 A beauty with brains, the HP Netbook by Studio Tord Boontje keeps you chic and connected, even when you’re on the go! The stylish Tord Boontje design and sleeve make the netbook half cool accessory, half computer. At first glance the 10.1” casing looks like just another intricate pattern printed on the lid, but it’s actually a brand new process called “HP Imprint 3D” which adds layers and depth to the design. I tested the netbook on my jaunt to Ceiba del Mar Spa Resort and it was a stylish travelers dream come true. You can opt to run Windows 7 or use HP Instant Web for easy access to wifi, email and online media. Managing files is so much easier and speedier with enhancements like Jump Lists and improved taskbar previews. Plus, great new features like HomeGroup, Windows Media Center, and Windows Touch take you into the future of computing. If you want to stay chic on the go I suggest checking out the Netbook by Studio Tord Boontje and HP’s other darling, the HP Mini Vivienne Tam Edition.